In the current epoch, retailers strive to create unique in-store experiences to better engage and retain customers. A broad spectrum of undertakings including product packaging, advertisement techniques, and strengthening of brand messages are crucial in boosting sales. Consumers of the current generation are more likely to visit again if retailers offer responsive customer engagement and superior in-store experience. Today, various innovative merchandising solution providers offer shoppers intuitive approaches to select and try on products, while delivering an immersive retail experience. Additionally, the shopping experience can be further improved with retail analytics, pricing strategies, inventory planning, product and shop floor management, and merchandising displays. There are a multitude of software vendors offering solutions that deliver strategic advantages to retailers with various perks for shoppers like reduced wait times and seamless mobile checkout. 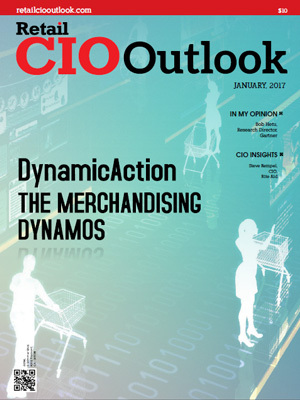 To help CIOs of retail organizations select the outstanding merchandising solutions, Retail CIO Outlook in this edition presents the solution providers that are transforming the retail merchandising environment. Retail CIO outlook brings forth the leading market players who are at the forefront of providing advanced merchandising solutions. A distinguished panel comprising CEOs, CIOs, VCs, analysts and the editorial board of Retail CIO Outlook has selected the final 10 merchandising solution providers, delivering innovative technologies that meet the burning needs of the industry. 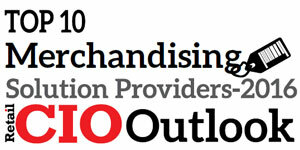 We present to you Retail CIO Outlook’s Top 10 Merchandising Solution Providers 2017. 7thonline Specializes in merchandise planning and demand forecasting for the apparel, footwear, and accessories industries. Applied Data Corporation Improving operational efficiency through the integration of data, organization, tracking, and labelling of fresh food products. Aptaris Improves margins, reveals past performance, reduces out of stocks, and drives profitability with a single system. DynamicAction Connecting and analyzing millions of data points from every part of a retail organization to improve merchandising processes. JustEnough Delivers innovative solutions to today’s complex merchandise planning challenges. Logility Develops retail optimization solutions that automate merchandise planning and allocation. Unbxd Provider of ‘e-commerce context-aware’ data platform delivering highly relevant and personalized end-to-end search experience.